In honor of Second Beach being reopened, we've updated our Kaleberg report, and we've added lots of new pictures in hopes of luring more people to this often overlooked gem on the Pacific. 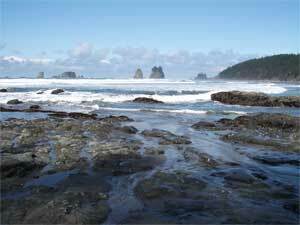 While there is no official agreement yet, the local Quillayute tribe feels that they are close enough to reopen Second Beach for the tourist season. This is great news. It means that one of our favorite beaches is being reopened, and that the Quillayute will have somewhere to go in the event of a tsunami. Since this is a local matter, there is not all that much in the media, but check out this KNDO/KNDU/AP article and this Peninsula Daily News background piece and update. It looks as if the Sappho maiden is gone for good. Our closest consolation is the carved wooden beaver statue in Beaver, WA. It's right by the diner. (Tuesday is Taco Night). We were able to get past the one mile crossing on our latest visit. There is much less water flowing in the stream there, so the water is only a few inches deep down by the ocean. Watch for the tumbling rocks, and don't stop for long. The water will undercut you. We sighted several eagles, some starfish, and the crew, with tents, carts and cameras, out on a Tommy Hilfiger fashion shoot. It was quite a production. Whiskey Bend Road is usually open all year round, but it has been closed for a while due to fallen trees and nasty ruts. It isn't much of a road by some standards, but it has a good solid one and a half lanes, and the dirt is pretty firmly packed and the drainage is good. In fact, it is so good that there are lots of neat waterfalls that flow down to and under the road. 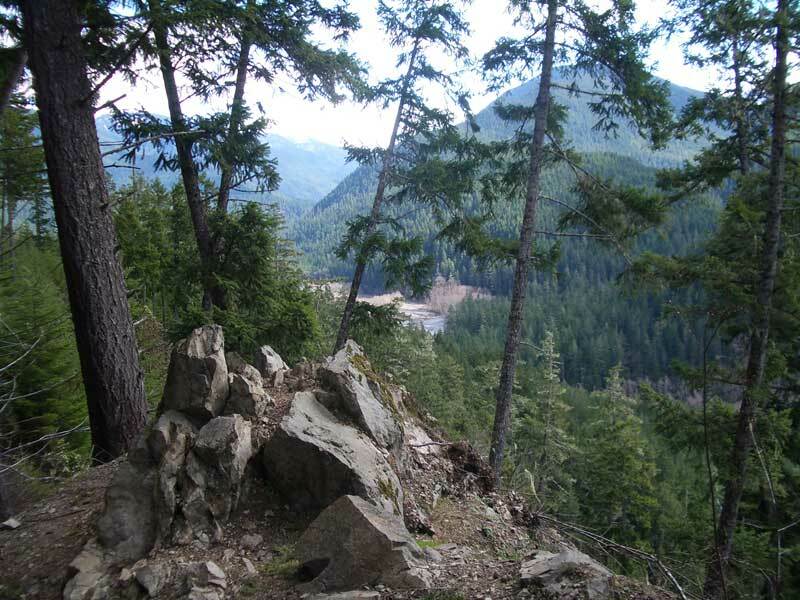 Just a few days ago, we noticed that the Park Service had taken Whiskey Bend off the list of roads that have been closed, and today we rode out in our trusty Honda and had a spectacular hike along the Elwha Trail. The road itself, as we noted, is in good shape, and so is the trail. There were a number of recently sawn logs by the side of the trail, including one monster on the climb up after Humes Ranch. We only made it to the first crossing, about an hour or so hike from the parking lot. The little stream in the canyon was running full, despite two large trees which had collapsed across its path into the canyon. 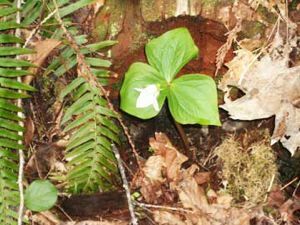 Our special surprise was the first trillium of the season, blooming early in the shelter of the canyon. 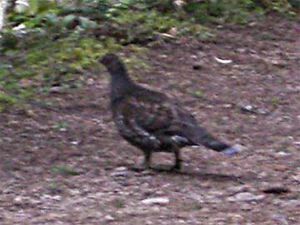 On our way back to the car, there was a blue grouse sitting in the middle of the trail. We had been hearing the deep booming of the male birds lekking, that is, staking out good sites for their bachelor pads. We sometimes see blue grouse on Hurricane Hill, but rarely on a wooded trail like this one, but today was different. 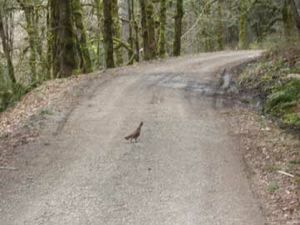 The grouse were definitely about and not one bit shy.We even saw another blue grouse crossing the Whiskey Bend Road on the drive down. That's our friend, Bill Peet, on the left, with a friend of his, a three foot long steelhead he caught out on the Soleduc River. There hasn't been much fishing lately, what with the spring floods and fishing restrictions, so that's a pretty amazing catch for the first day the river was fishable. The Soleduc is pretty amazing, too. 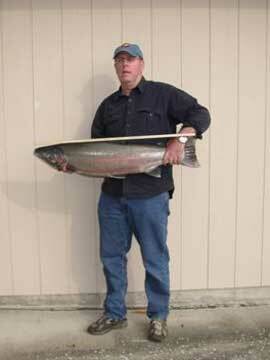 It's the only steelhead run in the lower 48, and it is in pretty good shape as you can see. Being Kalebergs, we must note that steelhead has a milder flavor than salmon, but it has salmon's firm texture.